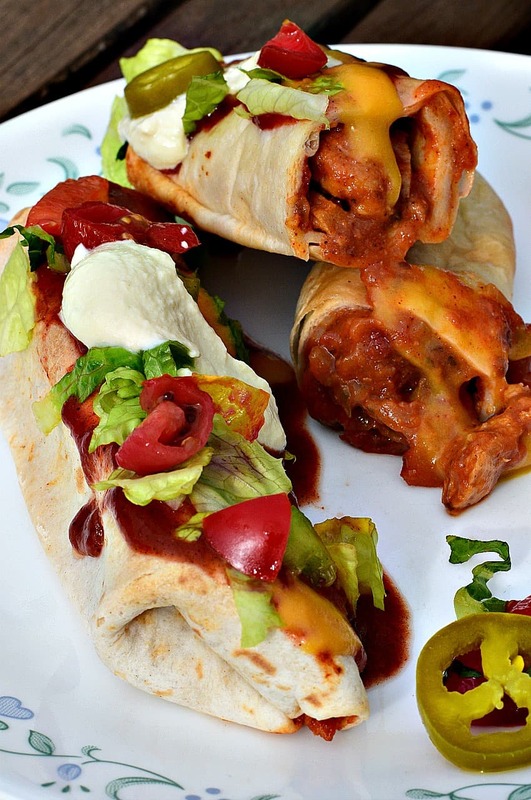 Imagine for just a moment – BAKED Vegan Chimichangas…. Now… imagine these Crispy Baked Tortillas literally STUFFED with Cheesy Soy Curls that were slow cooked in your favorite Salsa…. And maybe a dribbling of our favorite Vegan Cheese Sauce…. NOW, are you ready for this? Uh huh, I thought so…. And I got to tell you – your favorite Mexican Restaurant ain’t got NOTHING on these babies! Wife: What are we having for dinner? Me: Let’s see what we have…. Here’s a bag of Butler Soy Curls …… Cheesy Soy Curls?!? And here’s a can of RoTel Tomatoes – oooh and some salsa?! Sounding very yummy! And we have these Fat Free Tortillas….. Sounds like dinner to me! Mexican it is! 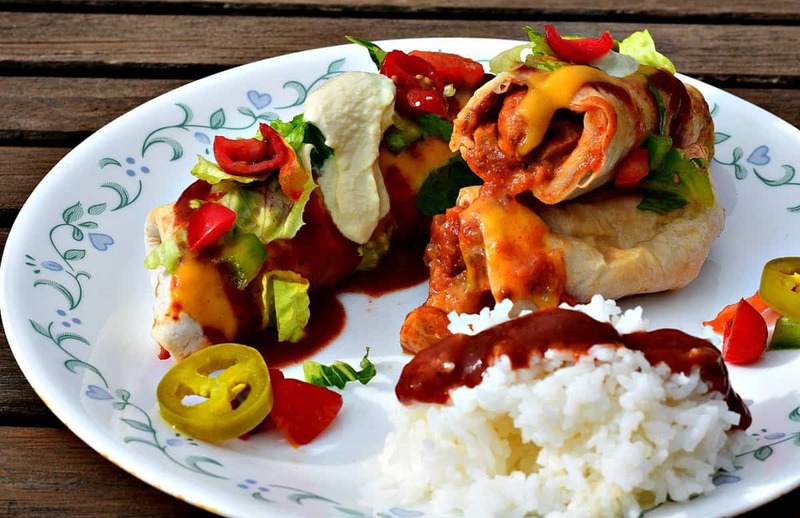 These Baked Vegan Chimichangas are actually very easy to make with a bag of Butler Soy Curls, Salsa, and a can of RoTel Tomatoes. I’ll include a link to Amazon in case you don’t have a Whole Foods nearby….mind you this is an Affiliate Link so I’ll make a few pennies on your purchase. First, in a medium bowl we’re going to add enough hot water to cover our Soy Curls, and then add 2 tablespoons of Soy Sauce – just to flavor them up a bit. Let those soak while you prepare the other ingredients. They WILL, however, send this meal over the top if you take the time to make them – but it’s entirely up to you. And the Soy Curls filling…. If you DO make all of the ingredients, be prepared to be in the kitchen for a while. But let me tell you, these Baked Chimichangas were beyond delicious, so it was SO totally worth it. If you clean up after yourself as you go – it’s really not that bad. The ingredient list for the sour cream is easy and only takes a few minutes to put together. So I made this first, then stored it in the fridge while I cleaned the blender. Press your Tofu between some paper towels to remove as much moisture as possible, then toss it into your blender with the remaining ingredients. Blend until smooth, and be sure and stop to scrape down the sides occasionally. Easy ingredients. Easy recipe. Ready in minutes. Next. One small pan, an 8oz can of Tomato Sauce, and some common spices make up the ingredient list. 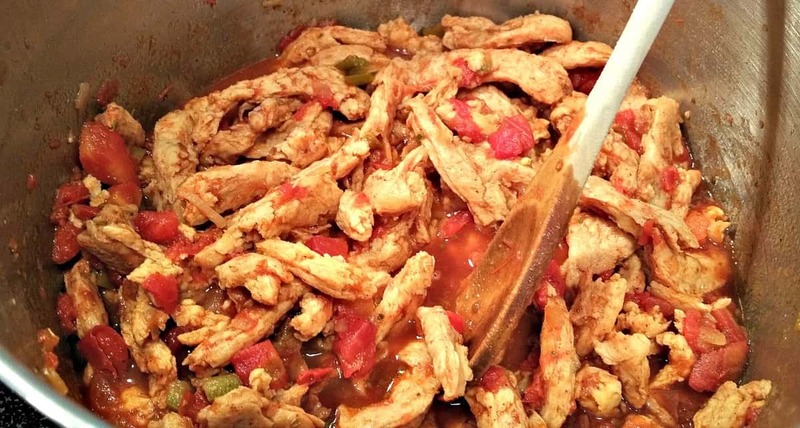 Whisk the Tomato Sauce and spices in a pan until smooth and then slowly pour in the water. Stir frequently until thickened. Ready in minutes. Store in a container until ready to use. This sauce needs no introduction. A combination of potatoes, carrots, and common spices turns into the gooiest, cheesiest, dairy-free sauce ever. Perfect for mixing with our Soy Curls. Boil the veggies until soft, and then blend everything together until smooth and creamy. You don’t want to skip this one – as we’ll need a cup of this for the Baked Chimichanga Filling. The chile powder, cumin, oregano, and smoked paprika. Let that simmer for a few minutes to allow the flavors to mingle, and then stir in 1 cup of the Cheese Sauce. Looks amazing doesn’t it? Because it IS amazing! Why didn’t I think of this before? Spoon about ¼ to ½ cup of the filling into the center of your favorite Tortillas. Fold over each side and then roll tightly. Place your Chimichangas seam-side down in a parchment lined baking dish and bake in a 400°F oven for 25 minutes – or until the tops have browned. Garnish with additional Cheese Sauce, Enchilada Sauce, Sour Cream, and fresh lettuce, bell peppers, jalapeños, and tomatoes. Your tummy is going to really thank you for this one! And as an added bonus…..
Easy dinner prep for the rest of the week! Yay! Soak the Soy Curls in hot water. Add 1-2 Tbls of Soy Sauce for flavoring. Press and drain the Tofu and add to blender. Add Tomato Sauce to a small pan. The recipe makes enough filling for about 16 Chimichangas. My glass baking dish only held 8 so I saved the other half to make the next day.